Automatic gate operators provide convenience and security to users. However, because these machines can produce high levels of force, it is important that all gate operator system designers, installers and end users be aware of the potential hazards associated with improperly designed, installed or maintained systems. Keep in mind that the gate operator is one component of a total gate operating system. Each component must work in unison with the others to provide the end user with convenience, security, and safety. This web page includes various safety precautions and warnings for the system designer, installer and end user. 'The warning are not exhaustive (due to the many and varied possible application), but they provide an overview of the importance of safe design, installation and use. The symbol (insert symbol) identifies some of the conditions that can result in serious injury or death. Take time to carefully read and follow these precautions and other information provided to help ensure safety system design, installation and use. WARNING: OSCO gate operators are only one part of a total operating system. It is the responsibility of the purchaser, designer and installer to ensure that the total system is safe for intended use. Familiarize yourself with the INSTALLER precautions and warning appearing on the following page. Users are relying on your design to provide a safe installation. When designing a system that will be entered from a highway or main thoroughfare, make sure the system is placed far enough away from the road to eliminated traffic backup. To eliminate potential traffic hazards, you must take into account distance from the road, gate size, levels of use and gate cycle/speed. 4. The majority of injuries from gate operator systems occur with Open Rollers or Ornamental "Grill Type" Gates. The illustration and descriptive captions below see safety 3 provide precautions to help eliminate injuries or fatalities. Familiarize yourself with them when designing the total system. Design gate systems so persons cannot reach through the gate to operate any controls. Control stations must be seven feet or more away from the moving gate and operator. Check to see that the operator being installed is proper for the gate's type, size and frequency of use. A freely moving gate will require less force to operate and will enhance the performance of the operator as well as the safety devices used with the system. Therefore, you must ensure that the gate has been properly installed and works freely in both directions before installation, repair or service any worn or damaged gate hardware. Install the gate operator on the inside of the property and/or fence line. Do not install and operator on the public side of the gate. Severe injury or death can result from entrapment by the gate. Therefore, if the vehicular gate is near a residential area or pedestrian traffic is expected near the gate, such additional safety equipment as electric gate edges or photoelectric sensors must be installed to prevent entrapment. If the gate is to close automatically, be sure loot detectors will be installed on both sides of the gate. An electric edge point is a potential hazard. Guard against these hazards! Certain types of gates can represent grater hazards to pedestrians. Any gate that has exposed, reachable pinch points is a potential hazard. Review the operation of the unit and become familiar with the manual-disconnect mechanism and the safety features of the system. You must install a push button control or a key switch to allow for manual operation of the gate if the automatic gate entry controls do not work. When installing a push button control, locate it in a secured area within sight of the gate. Both push buttons and key switches must be located seven feet or more from the gate, gate operator and fence to ensure that the user is out of the reach of a moving gate. Outdoor or easily accessed automatic gate opener controls should be security type to prohibit unauthorized use. Be aware of all moving parts and avoid close proximity to any pinch points. Know how to operate the manual-disconnect mechanism. Adjust the clutch to the minimum force required to operate the gate smoothly without slippage, even during mid-travel reversing. Do not over-tighten the clutch. Place controls a minimum of seven feet away from the gate so that the user can see the gate and operate controls but cannot touch the gate or gate operator while operating the controls. Warning signs must be placed on each side of the gate or in high-visibility areas to alert of automatic gate operations. You are responsible for ensuring that the end user understands the basic operations and safety systems of the unit including the location and operation of the manual disconnect. Point out that the safety instructions are the responsibility of the end user and then leave a copy of this web page with the end user! The manufacture of the gate operator mechanism does not know what type of gate you have or what types of automatic systems are installed on your gate. Be sure you've been fully instructed on the sequence of operation of your specific gate-system. To ensure safe operation of your gate system, you must read this web page and keep it for reference. Be sure the instructions are distributed to all persons authorized to use your gate. Keep Clear of the Gate area (front and back) at all times. Your automatic gate is not for pedestrian use. Do not allow children near your gate. Do not operate your gate system unless you can see the gate when it moves. Be sure a push button or key switch has been installed for manual electric operation in the event your automatic entry controls do not work. Any key switch should be located not less than seven feet away from the gate so the gate or the gate operator mechanism cannot be reached or touched. Any puch button located in a building should be installed within sight of the gate. Do not operate any control device without monitoring the gate's movement. Do not over tighten the clutch to compensate for a damaged gate. The gate should always be maintained to operate as easily as possible to provide protection. Periodically check all safety systems. If these systems are observed to operate improperly, discontinue their use and have a qualified technician service the system immediately. Your operator is equipped with an emergency disconnect for manual operation. Be sure you understand how to operate the manual disconnect safely. You must receive detailed instructions about the operation of the manual disconnect from you installing dealer. If you feel you haven't received full and proper instructions, contact the factory. You are responsible for ensuring that the warning signs provided are installed on both sides of your gate. If your gate has open rollers, be sure roller guards have been purchased and installed. Internal operator load sensors and friction clutches might not be sensitive enough to prevent arm or hand injuries. For this reason, padded electric gate edges, or photoelectric sensing systems are recommended when automatic gate openers are used near pedestrian traffic. A suggested system is shown above. Use of a separate pedestrian walk gate is always recommended. Injuries occur when people put their arms through openings in the grills and the gate is operated. The person cannot retract his/her arm and it get caught between the grill and the fence post or fence. 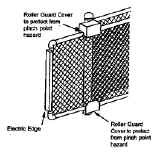 This potential hazard can be averted simply by placing a mesh on the gate and the fence in the area of the gate. This will help to prevent access through openings when the gate travels.